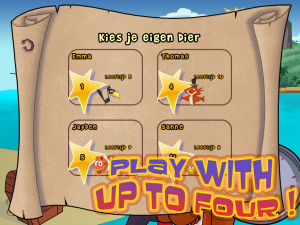 DISCOVER THE ISLAND HABITAT AND HELP PIRATE ROUGH’NTOUGH TO GET BACK TO HIS SHIP! 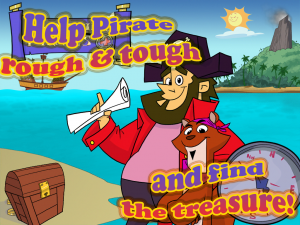 In this educational game young treasure hunters are encouraged to explore and discover. An environment full of challenges awaits them. Follow the trail on the treasure map to the spot marked with the X, 9 challenges are ready for kids to play and learn with. ‘Discovering pirates’ offers 9 free games in one, with increasing difficulty levels. This is a totally new way of learning by playing where the game play and fun of the child are put first. Discover a new way of handling challenges and earn stars for solving each task. 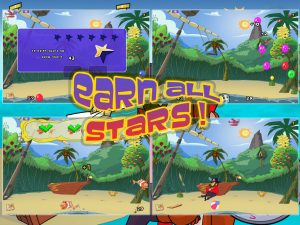 If you have collected enough stars you might even get a part of your first PIRATE CERTIFICATE! 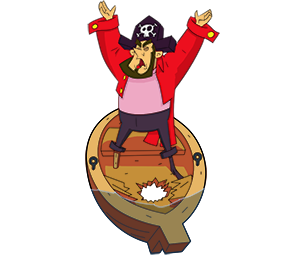 Discovering pirates has been handcrafted by the best artists in regards to music and animations, the music was specially made by well known music composers so to offer you the best possible quality.